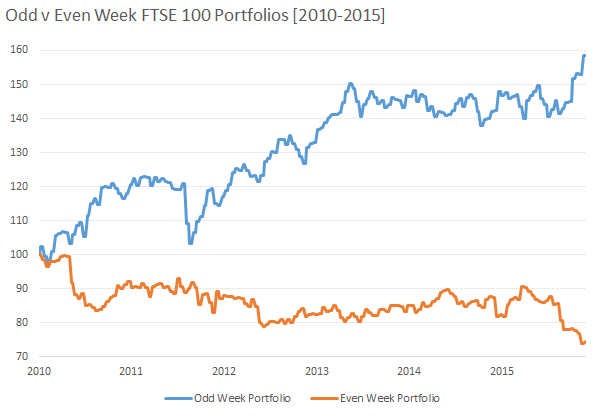 Odd Week Portfolio: this portfolio only invests in the FTSE 100 in odd-numbered weeks, and is in cash for the even-numbered weeks. Even Week Portfolio: this portfolio only invests in the FTSE 100 in even-numbered weeks, and is in cash for the odd-numbered weeks. 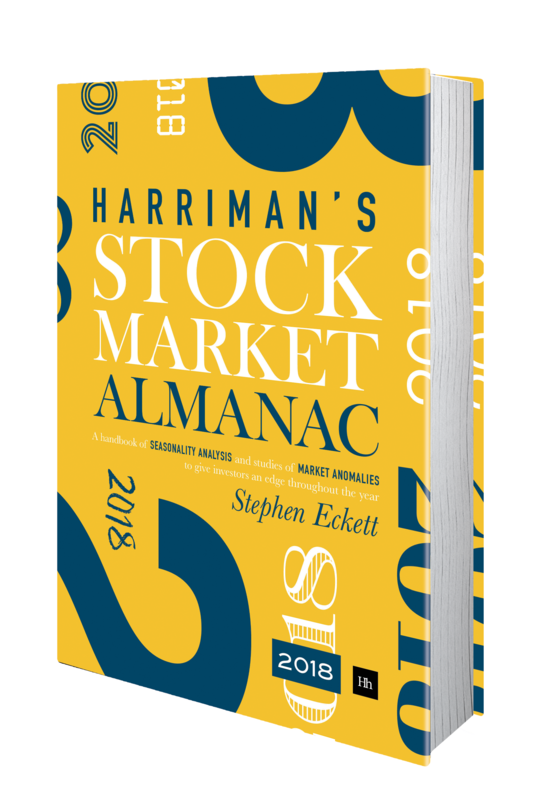 The portfolios started investing at the beginning of 2010 with values of 100. The weeks are numbered according to the ISO 8601 numbering system, whereby the week containing the first Thursday of the year is designated the first week of the year (this is also called the European week numbering system). The divergence in performance in the two portfolios is quite striking. By the end of November 2015 the Odd Week Portfolio would have had a value of 155, and the Even Week Portfolio a value of 74. And, as can be seen, the divergence has increased significantly in the last few months (since August 2015). It may not be possible to exploit this phenomenon due to trading costs, but it is certainly rather bizarre. Has this been a long-term phenomenon? 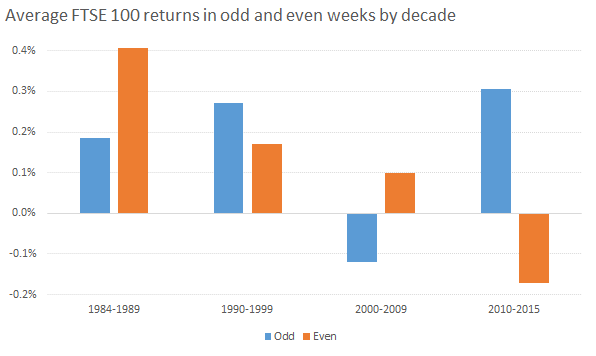 As can seen, there has been no consistent relationship between odd and even week returns. In the decade 2000-2009, even weeks were on average stronger than odd weeks, whereas this decade the relationship has reversed – and, as mentioned above, for the moment the divergence is increasing. While there is no obvious (or, for the moment, non-obvious) explanation for this weekly phenomenon, such weekly effects have been seen elsewhere – for example, the FOMC Cycle. This entry was posted in Market, News, Week analysis and tagged FTSE 100, odd-even week, UKX, week by Almanacist. Bookmark the permalink.